There are those for whom becoming a visual artist is a lifestyle or career choice, a decision governed by pragmatic considerations. Will I be able to pay the bills? Will I have opportunities to show my work? Will I be respected? There are others, “Sunday painters” or hobbyists, who indulge their creative urge as an adjunct to their daily lives in ways wholly satisfying to them. And, of course, there are many individuals, serious artists, who balance their creative practice against financial and familial obligations. There is, however, another class of artists, those for whom the compulsion to create is overwhelming and whose vision and voice is so keen that they have no choice. They must create as surely as they must breath. Painter Mike Hartung is such an artist. Since 1975 Hartung has quietly maintained a studio in a loft above a storefront on Main Street in Lindsborg, Kansas—a small, charming Swedish-American community nestled in rural central Kansas. There, in relative anonymity, he has produced untold hundreds of large-scale paintings over the past four decades. He has worked without desire for notice or financial gain. There, in relative anonymity, he has produced untold hundreds of large-scale paintings over the past four decades. The individuals who laid eyes on the artist’s imagery between 1975 and May 2015 can be counted on one hand. The morning of May 11, 2015, Hartung generously opened his studio to a small group of a dozen or so guests that included museum directors and curators, artists, friends, and acquaintances. Two of Hartung’s closest friends, artists Richard and Laura Klocke, coordinated the studio visit. In the fall of 2013 Laura Klocke, who had not seen or spoken with Hartung in a decade, visited him while she was in Lindsborg to attend a funeral. She found the artist in poor health and in the grips of a protracted creative drought. Soon thereafter, Klocke, her husband Richard, and Randy Just, a mutual friend, intervened. The three friends’ care and concern lifted Hartung out of his funk and set him back on track. Eventually, they persuaded the artist to let them document his prodigious output and to entertain the possibility of sharing his work with a wider audience. Over the course of five days in November 2014, the Klockes and Just descended on Hartung’s Lindsborg studio and began the process of photographing and otherwise documenting his work. Hartung’s paintings are exuberantly cheerless, composing a veritable catalogue of human predicament. His insistence on narrative and the figure is steadfast. The artist’s subjects are not poster children for the American dream; they are denizens of a certain, darker American and human reality. His paintings are not fanciful grotesqueries, but rather emanate from an unease all too familiar and resonant. The places and spaces he depicts (gas stations, laundromats, cafes, streets, etc.) are real and part of life in central Kansas. Though much of Hartung’s imagery is psychologically wrenching and tough, one senses, underneath it all, a pervasive and ineffable joy. Painting is, for him, an incredibly joyous act, evidence of which even the darkest themes and subjects cannot conceal. Hartung’s paintings are exuberantly cheerless, composing a veritable catalogue of human predicament. Much of the artist’s imagery is peopled with solitary figures, usually women, weary from life’s daily toll. 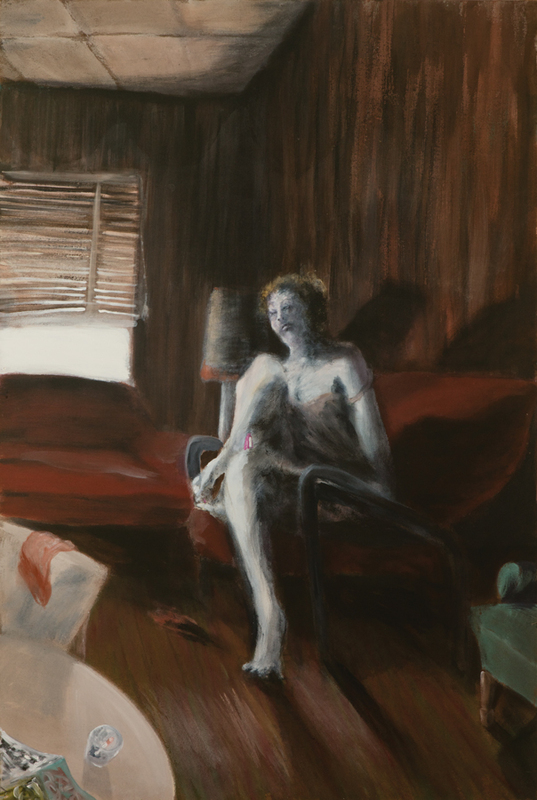 The preponderance of female subjects speaks to the artist’s biography and the familial circumstances of his youth. His parents were estranged for a time during his childhood, and Hartung and his sister lived with their mother. Her nurturing and unflagging support was vital for the artist, particularly with respect to his early creative development. Hartung’s exhausted waitresses, listless teenagers, and struggling single mothers occupy a world of drenching ennui. In paintings such as In a Trailer House (see below: 1990s, 72 x 48 in. ), his subjects seem overcome with a nameless languor. Other works are much more despairing. Sleep in a Closed Garage (see below: 1980s, 48 x 48 in. 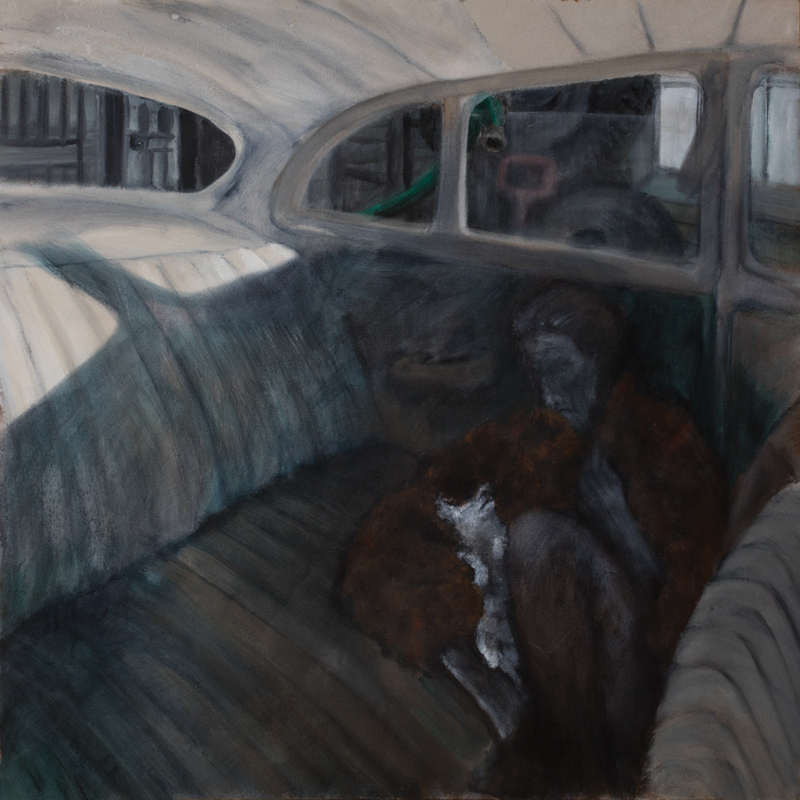 ), a scene of tenebrific poignancy, depicts a woman and her small dog curled up on the floor in the back seat of a garaged car. Engulfed in shadow, she awaits her fate, the end of a green garden hose hanging into the car through a narrow opening in the back window above her, the other end presumably attached to the exhaust pipe. Hartung is equally adept with groups of figures. In this context, individuals appear as ensemble players bound by disinterest, dysfunction, or worse. Thank You Terry Evans (see below: 1992-93, 96 x 192 in. 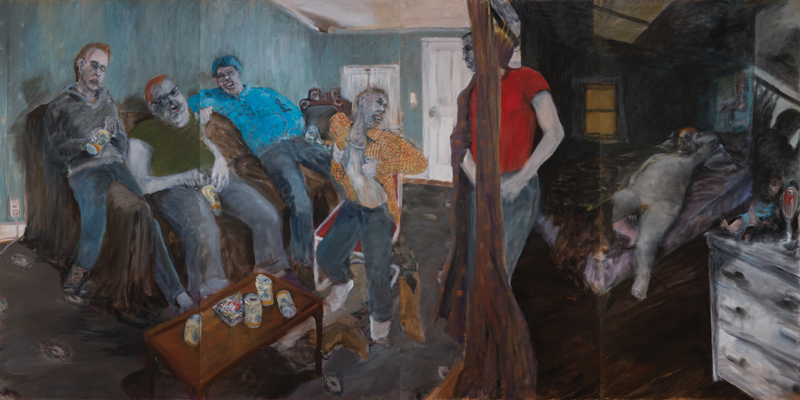 ), a large painting (eight by sixteen feet) from the early 1990s, was inspired by a conversation the artist had with his friend Terry Evans, the noted photographer. Evans related an encounter she had with a brother and sister, both of whom were mentally challenged, while on a photo shoot. The experience led her to suspect that the brother was pimping out his sibling. The anecdote sparked Hartung’s imagination, and he went to work on the mural-like painting immediately. The deeply troubling scene is played out in adjacent rooms of a nondescript domestic interior. Here, Hartung’s considerable formal skills are evident in his mannered treatment of the figures and his use of oblique perspective to solve the compositional conundrum of uniting incidents taking place simultaneously in separate physical spaces. On a couch in the living room on the left side of the composition slumps the red-haired, bespectacled brother, a can of Coors beer clenched between his legs. A group of three witless males await their turn as another figure enters the space through the bedroom doorway while zipping his pants. Behind him, the naked and splayed sister lays on a bed, her red hair and glasses betraying her relationship to the procurer in the adjacent room. Formally and conceptually, Tailgating with The Grand Old Party (bring the kiddies) (see below: 2015, 96 x 240 in.) is Hartung’s most ambitious and complex painting to date. Monumental in scale (eight by twenty feet), this tour de force of compositional deftness and paint handling is a compendium of many of the most significant developments in expressionist painting of the nineteenth and twentieth centuries. Echoes of Francis Bacon, Otto Dix, James Ensor, Lucien Freud, Francisco Goya, and George Grosz, among others, reverberate throughout. This is no cut-and-paste pastiche, but rather a well wrought synthesis and integration of past advances to create something new, something of its own time and place. In the end, the voice is Hartung’s alone. Teeming with scenes of fantastical acts of debaucherous inhumanity, Tailgating with The Grand Old Party (bring the kiddies) is unquestionably a tough painting. Many will find the imagery objectionable, even offensive. Painting isn’t always about pretty pictures. Art history and the work of the aforementioned expressionist painters is testament enough to this fact. Hartung is not out to shock with paintings like Tailgating with The Grand Old Party (bring the kiddies). He is painting for himself, not the public. For the artist, who grew up Republican and felt “Nixon was a far superior candidate than Kennedy,” the painting is a personal expression of his feelings about the current state of culture, politics, and everyday life in America. It is an important painting. It raises important questions and issues. We should look at it. We should think about it. We should talk about it. And, we should be grateful for artists who have the courage to give image to their innermost thoughts and feelings, and even more grateful for those, like Hartung, who have the courage to share. Adapted, with permission, from Bill North, “Foreword,” in Hartung (Lindsborg, Kansas: The Birger Sandzén Memorial Gallery, 2017). Bill North is the Executive Director of the Salina Art Center in Salina, Kansas.